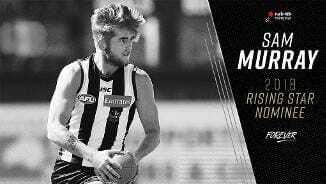 For new Magpie Sam Murray, it's been a steady rise from rejected country footballer to Collingwood's round one bolter. 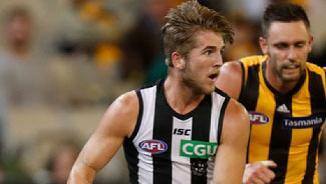 In Sam Murray, Collingwood gain a hard-running defender who has spent the past two seasons on Sydney's rookie list. 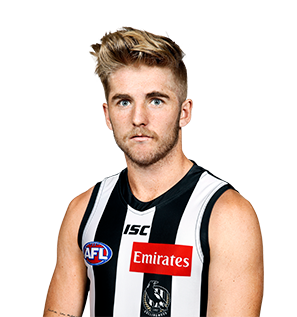 Hard-running Sydney defender Sam Murray joined Collingwood during the October trade period at the end of the 2017 season. The 20-year-old spent the past two seasons on Sydney’s rookie list. He excelled after being moved into the backline in 2017, averaging 22 disposals per game, using his hard running and long left foot to advantage. Hailing from country Victoria, Murray was overlooked for a place in the Murray Bushrangers TAC Cup squad for 2015. Instead, he plied his trade for the Wodonga Raiders, finishing third in the Ovens and Murray Football League’s Morris Medal at the age of 18. After representing the Ovens and Murray League at Under 19 level in 2015, Murray was selected with pick No. 66 in the November Rookie Draft. He kicked 16 majors playing as a small forward in the NEAFL in 2016 before being swung into defence this season, when he was named in the NEAFL Team of the Year.